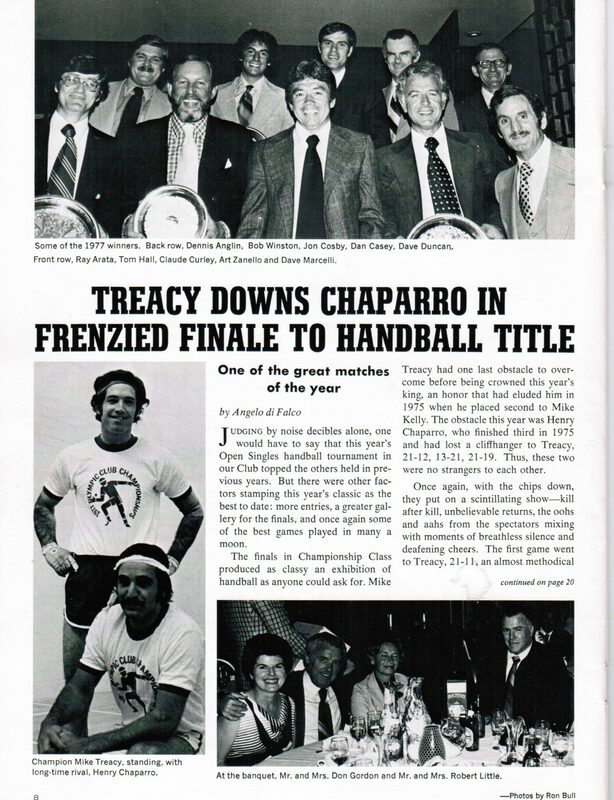 Mike Treacy began his long handball career on the courts of St Ann’s Grammar School in the Sunset District. Being a top flight youth baseball player, he was a handball natural. Health issues and a tough upbringing delayed his progress until he attended Sacred Heart High School and discovered the famous handball courts of Golden Gate Park. The Park provided Mike with a “real family” and it was there that he honed is game with many of the Park greats. Names that all of us should remember, like Coleman, Perrucho, Breining, Kelly, O’Brien, Beaver, and Meneken all played the game with reckless abandon and Mike Treacy was the leader of the pack. The Olympic Club heard about this exciting young player and he became a member, enjoying all the benefits of travel and tournaments that the Club provided. It was here that he teamed up with Mike Kelly, and they became a force in the handball world of the 60’s and 70’s. During this period, Mike was tutored by one of the all-time greats, and the first inductee into our Hall of Fame, Al Banuet. Mike would pick up Al, at his home in the City, and drive him to the Park courts for hour after hour of strategy sessions. Al would instruct him on court positioning, percentage killing, fly-ball offense, and “trick shots,” all perfected by Mike. It was Al’s philosophy that strategy was as important as skill level, and “dissecting” ones opponent before stepping on the court was the foundation upon which victories were built. Dividing the court into four quadrants and practicing hundreds of shots from each location, enabled him to always have in his arsenal a kill shots ready, no matter where he was on the court. Mike learned, by watching his perspective opponents, what they did well and what their weaknesses were. He would press their weaknesses and avoid their strengths. Al also stressed making your opponent always aware of your presence, and by playing “close,” making him feel uncomfortable. Another Treacy characteristic I personally remember. His Championships are numerous. Singles and doubles titles at various Clubs, State, Regional, Memorial Day, and out of State, primarily Arizona, abound. One of the great upset in USHA handball was at the 1975 Nationals, where Mike and Mike beat Rey Neveau and Simi Fein in the semi finals. Neveau and Fein were the two time defending National champions and they never knew what hit them. No matter what the shot or from what location on the court, Mike and Mike never hit a straight ball. The hops, both ways, with either hand, were a thing of beauty. Mike’s stay at the Olympic Club was relatively short. He always missed the “family connection” of the Park, and he returned there to continue his career. Heavily into Zen meditation, he continued to win although his travel time was down. He played for the National Masters Singles title in Las Vegas in 1985, against perennial champion Pat Kirby. They split the first two games and the score was 8-8 in the tiebreaker. Kirby, up to this point had constantly hit hard serves to the left, but at this crucial time of the match, he changed his strategy and served 3 crack serves to the right for the title. It was a devastating loss for Mike. He wanted, so badly, to win that one for Banuet, but it was not to be. Although Al had died in the late 60’s, Mike fervently believed that Al’s spirit was with him, that day of the finals, and that loss would always remain with him. Mike got very emotional discussing Banuet and that match, and it was evident, how important it was to him. Age division handball never interested Mike. He always felt that competing against the best was handball’s best test, and that meant Open play only. After Las Vegas, his tournament days were over. Having competed against Mike many times, it was a real treat for me to write this profile and reminisce about many of his great matches. He was a remarkable player and competitor. His offensive arsenal was unequaled, and his tournament records speak for themselves. Congratulations Mike on your induction and welcome into the Northern California Hall of Fame.